Divorce & Family Law Attorney | Snellville | Harold D. Holcombe P.C. Divorce can be heartbreaking. Not only do you have legal issues to deal with, but you have additional emotional, psychological, and financial issues that accompany every divorce. The stress of a divorce can lead to mental and physical health complications. At one time in our country, you had to have a reason for a divorce, like adultery or cruelty. Today, anyone can get a no-fault divorce on grounds that the marriage is irretrievably broken. It takes two to get married, one to get divorced. For over 25 years, we have counseled clients and guided them through the divorce process. Sometimes, you just “want to get out,” but at the same time, you have to consider the needs of yourself and your dependents. We at Harold D. Holcombe P.C. can help you get through this. Remember, this situation is only temporary. A divorce is a civil law suit. There is a summons, complaint, usually some standing orders, and other documents which must be filed by the Plaintiff. Common documents required to be filed with the court, at some point during the proceeding, are the parenting plans, child support worksheets, child support addendums, financial affidavits…the list goes on. It’s complicated. The issues in a divorce can be simply stated as follows: child custody, child support, alimony, property distribution, and debt distribution. Each area can be complicated. Each area has a Georgia Code Section associated with it, and hundreds of legal cases that support various legal positions. The reason you hire us is because we have been there, done that. We only practice family law. Family law is our life. We know how to deal with the legalities, the people, and the system. 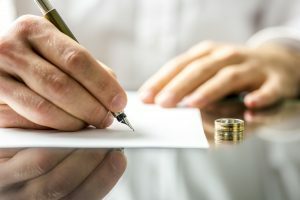 Generally speaking, an uncontested divorce is one that the Defendant does not contest, meaning that they have either agreed to all the desires of the Plaintiff by agreement or simply do nothing. Sometimes, it’s unrealistic to think that during a marriage in which nothing was agreed upon, that, at the end of the marriage, the parties will agree on everything. First, the law is complicated. Therefore, choosing an attorney with a focus on family law can only help you. Secondly, the business of law is adversarial. The mindset of a criminal attorney can be “US” against “THEM”. Therefore, a good criminal attorney is aggressive, hard hitting, hard working, and persistent. They file motion after motion, turning over every stone, and in doing so, they must be very aggressive. However, I believe that a good family lawyer looks at the big picture and does not destroy the other party in order to achieve a temporary result. Most of the times in family law the parties have, or have had, a relationship, which at some time was good. Many times, the parties have children or even grandchildren. A good lawyer can be assertive and advocate strongly for their client without destroying everything in their path. I believe, regardless of what you hear, that you can achieve a great legal result by using the law as your sword and shield, and not resorting to overly aggressive tactics employed by some. In a divorce, determining the equitable division of property can be a critical aspect of the lawsuit. Many men work 20 or 30 years at a job, only to find that their wife, who is divorcing them, is entitled to an “equitable division” of the marital property, which includes their pension and retirement, as well as the rest of the “marital” property. Women may find that their husbands have emptied the retirement savings and there are no more assets. The case scenarios are endless! As lawyers, our job is to determine what a judge may decide is equitable. Our first step is to identify exactly what is marital property. Generally speaking, your average attorney may tell you that this is 1/2 of the marital assets. Not so fast, my friend. An equitable division is based on numerous factors, and a good attorney will point these factors out to the trial judge. So, if you’re the husband or the wife, you will be fighting to ensure that you receive your equitable share, based on your contributions to the marriage. The side you’re on will determine your legal argument. Our job as your attorney is to present these facts in a light most favorable to our clients. Twenty-five years of experience has helped us to know what to do and how to do it effectively. We’ve represented both men and women. The conduct of the parties can be extremely important in an equitable division case, so always be on your best behavior. A divorce is a lawsuit. Some of the forms commonly filed during the divorce process are Civil File Action Initiation Form, Summons, Complaint, Verification, Standing Orders (by county), Permanent Parenting Plan, Child Support Addendum, Child Support Worksheet, Consent Agreement, Motions (various), Final Decree and Judgment, Agreement to Try in 31 Days, Waiver of Jury Trial, Income Deduction Order, and so on. As your representation, we will guide you through these various forms and help you navigate this somewhat confusing process. More questions? Harold D. Holcombe P.C. is here to help. Call our friendly Snellville office today at (678) 344-0116 to speak to a Gwinnett County attorney who has the expertise to answer all of your divorce and family law legal questions.